These ladies. Hard working, stylish, well traveled, sarcastic, and sisters. If you've met Alexia and Emma of Kindred Blooms, most likely you fell in love with them and wanted to become their best friends (I know i'm not alone in this situation). Their ability to turn a space into a dream continuously blows my mind (again, I know i'm not alone here). Take a peek at our little interview and fall more in love with them and their work! You two lovelies are sisters (duh). Tell us a little bit about how you both got the green thumb and what made you start a your own floral business! Our mom was actually a florist and master gardener. We grew up around flowers our whole lives. When we were younger she started her own floral business, and worked out of our house. She would blast the air conditioner and turn the living room into her cooler. We saw the ins and outs of the wedding world from a young age, which I think had an impact on us ending up where we are. We were living together for a time, and that’s when we really started to realize that we had not only an interest, but a passion that led us into this career. The phrase that we have really connected with as of late has been “contained-organic”. We like to create natural shapes that have movement, without going too over the top. We always like to tell our clients that they should be wearing the flowers and not the other way around. Flowers should be there to compliment an event, but not overwhelm it. Talk to me about foraging (because I’m obsessed) and when it’s a good idea and when it’s not. What are you seeing as a trend for 2018/2019 weddings? We are seeing a lot more of people straying away from traditional color palettes, and leaning more towards creating impact with texture and shape. Carnations of all things are having a moment, and we are seeing some tropical elements such as anthurium making their presence known. The use of non-traditional vessels for centerpieces is another big one as well as single-type arrangements. What is something you have always wanted to try with flowers? We have always really wanted to do a fabric and floral installation. Do something really over the top that creates a huge impact...and we get to do just that this year at the Machine Shop. What are challenges you face when it comes to a wedding that maybe couples don’t think about when hiring you and asking for a certain thing? Installations, in general, can be really challenging to the budget, and the timeframe for the day. A lot of people are looking to create these standout moments for their events, but they can be extremely costly. A lot of places require the rental of a lift to be able to hang from the ceiling. They are also challenging because they usually have to be at least partially constructed onsite. This can sometimes create an eyesore and potential obstacle typically in the middle of the room. We try to work on those elements first, and then move onto other parts of the design. Oftentimes, we have to have the client book extra time into the set-up for us to be able to get them done. If a client comes to you to book their wedding or event, what does that process look like for them? What information should they have when they come to you so they can get down to business? We typically ask that clients fill out our inquiry form on our website. It covers the basics of what they are looking for, and we can typically tell right away if we are a good fit for them. After we make initial contact, we schedule either an in-person (preferred), or phone meeting to discuss everything in greater detail. We love to have all the numbers before the meeting and have them come prepared with visual inspiration to help us understand their style. After meeting with the client we prepare a proposal that typically includes a style board with it. We like to include images that are not our own work so that clients can feel free to give us honest feedback. After that point, we work until we find a budget that is agreed upon by everyone. Flowers are seasonal - how do we educate couples on how to best pick flowers and colors based on the season they are having their wedding/event in? We always tell people that if you feel really strongly about a specific flower, you should schedule your wedding date around that season. We are always very upfront with people about what they can and cannot have. 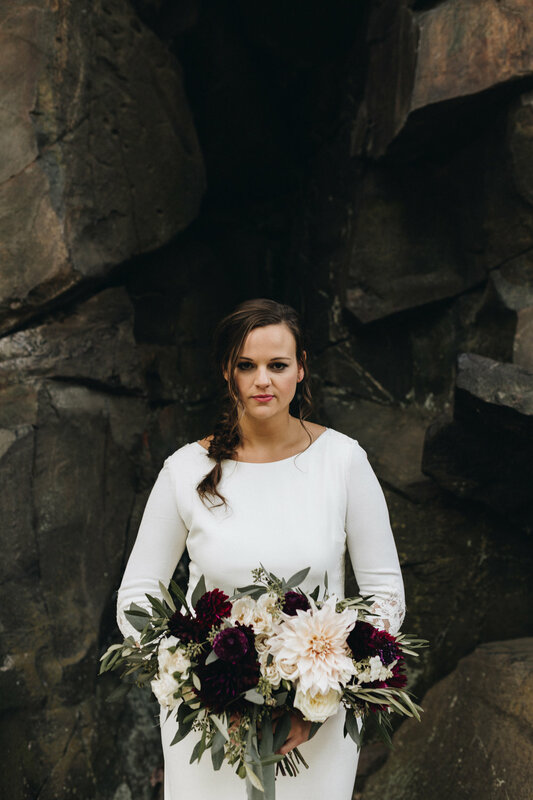 September brides come to us all the time wanting peonies, but we are able to quickly steer their attention toward garden roses and dahlias, to give them that same feeling with an in-season bloom. Color is a bit easier to work with. We can always find substitutions within a color palette as long as the client is flexible with the types of blooms we use. What are other things you want brides to know when it comes to booking you or just researching their florists? There is a florist for every client. Our style may not be the right style for you….and that is totally ok. We would rather see you book with someone that is a good fit, then try and mold ourselves into something that we are not. Also, we might drop a cuss word (or two) in our meeting...we won’t mean to...but it might happen.